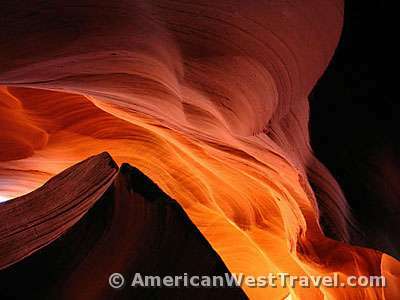 Visitors to the American West who wish to become superstar photographers for a day can easily do so here in Arizona! 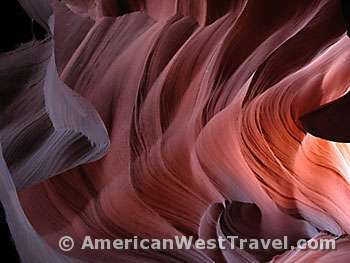 One of the state’s great wonders is Antelope Canyon, within the Navajo Nation in northern Arizona. 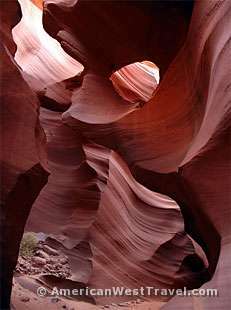 Parts of Upper and Lower Antelope Canyon form into “slot canyons”, one of Canyon Country’s most exquisite and unusual phenomena, and a place abounding with fantastic and easily accessible photo opportunities. 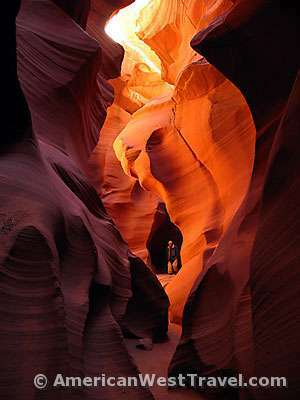 Lower Antelope Canyon is therefore less congested with fewer tourists and casual visitors. Yet the canyon is also very easy to visit: the single, designated tour concession has a booth at the parking area (take Antelope Point Road north from AZ-98) adjacent to the canyon entrance. Photographers, defined by your having an SLR camera and a tripod, may have an extended stay, up to four hours, at no additional charge. Winter and summer visits also provide different experiences. 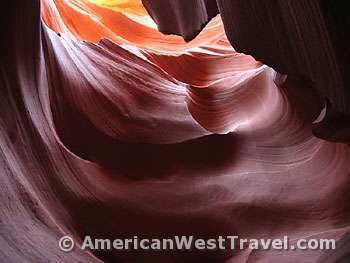 Our May, 1999 visit to Upper Antelope Canyon provided a high mid-day sun and mild temperatures. The high sun can penetrate deeply to the bottom of the canyon providing deep contrasts between bright sunlight and the dark, shadowy canyon. The presence of visible sunbeams is especially prevalent in the upper canyon, providing opportunities for fantastic photo compositions. During our recent mid-winter visit, the sun did not deeply penetrate the lower canyon; for the most part just reaching the upper walls of the canyon. However, as this page shows, the softly glowing upper walls contrasting with the darkness of the lower walls, and accompanied by a few glimples of sunlight, still make for fabulous photos. The lower canyon is also very cold in the winter! The subterranean chamber of rock is far colder than above ground. While it was in the 40’s °F (4’s °C) above, it was certainly near or below freezing in the canyon. Bring gloves, hat, and warm clothes in the winter. Slot canyons are exceedingly narrow, sheer-walled sandstone canyons, sometimes only a few feet wide and hundreds of feet high. These constricted canyons can cause spectacular flash floods during the occasional powerful summer storms in the region. The force of the floodwaters combined with eons of time carves and polishes the canyon’s sandstone walls into exquisite shapes. The canyon shadowy walls often combined with sunlight beams create scenes of unbelievable and surreal natural beauty. As the day goes on, changing light angles create a kaleidoscope of patterns and colors. 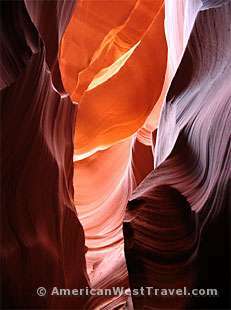 Slot canyons generally start as a surface or subsurface fissure. 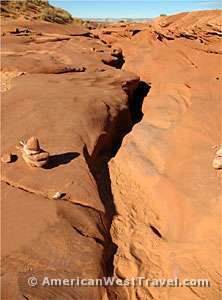 Much of the Colorado Plateau consists of solid blocks of sandstone, which sometimes crack leaving a fissure where water may accumulate. A downslope can cause it to become a drainage channel. The awesome erosive power of flowing water then interacts with the soft sandstone over eons of time to create a slot canyon. 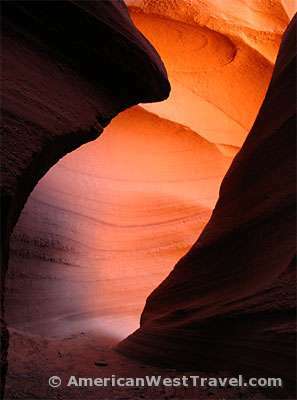 Unlike many slot canyons, both Lower and Upper Antelope Canyon are relatively accessible and easy to visit. You simply show up and walk in. Many slot canyons are filled with obstructions such as debris, deep pools of standing water, and quicksand. You need to be a serious, adventurous outdoors person to negotiate such canyons. For more information on guided tours, hours, and fees, please visit the Antelope Canyon-Lake Powell Navajo Tribal Park website or call (928) 698-2808. 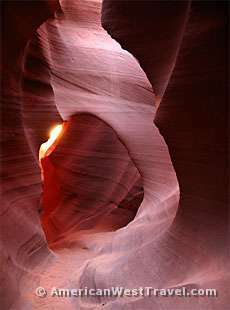 With the proper equipment, an individual with modest photographic skills can take a great picture at Antelope Canyon. Here are some tips from our resident photographer. Use a good digital or SLR camera that allows you to set the aperture and shutter speed manually. Use high-speed ISO 800 or better for hand-held photographs. For slower ISO speeds, A tripod is necessary for the slower shutter speeds and longer exposures. But beware that the canyon is narrow and can get crowded requiring you to move your tripod. The canyon can be quite dusty so try to avoid changing lenses if you can. The best time to get photos of the light shafts would be at mid-day when the sun can shine into the narrow canyon. Your camera’s meter may under or overexpose the scene, so it is best to bracket your exposures. Look for good lighting within the canyon. Strong sunlight and deep shadows can make it challenging to get good photographs. Travel light as the canyon walls are extremely narrow. You will also need a free hand to hold on to the railing of the steep metal stairs as you move up or down the canyon. The railing can be freezing to hold onto during winter. Stay hydrated. Be sure to carry water with you.